Feature Creature at Tate Modern. CiCi Blumstein 2002 – installation view from galleries. Feature Creature at Tate Modern. 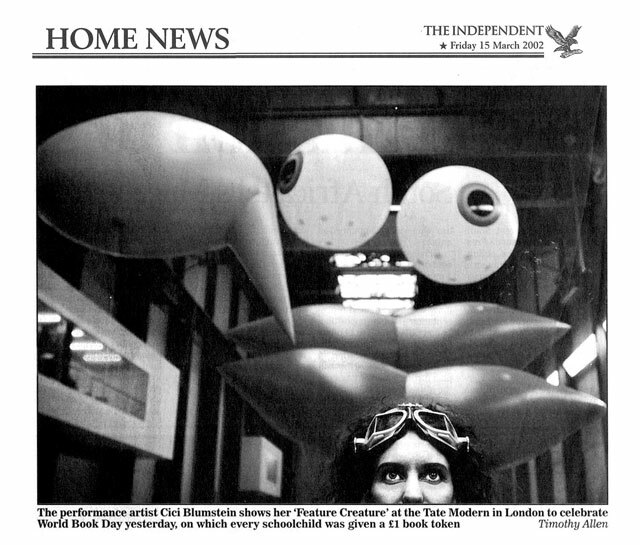 CiCi Blumstein 2002 – test rehearsals at Fabrica art gallery, Brighton. Feature Creature at Tate Modern. CiCi Blumstein 2002 – Original design rendering of the helium inflatables by Aerotrope. Feature Creature at Tate Modern. CiCi Blumstein 2002 – coverage by The Independent. Feature Creature at Tate Modern. CiCi Blumstein 2002 – installation view from Turbine Hall mezzanine. Feature Creature at Tate Modern. CiCi Blumstein 2002 – installation view from Turbine Hall entrance. Feature Creature at Tate Modern. CiCi Blumstein 2002 – installation view from mezzanine. Feature Creature at Tate Modern. CiCi Blumstein 2002 – visitors at Tate Modern have a close encounter with the Feature Creature. Feature Creature at Tate Modern. CiCi Blumstein 2002 – School children explore the live mixed sound and video installation by Testcard. Feature Creature at Tate Modern. CiCi Blumstein 2002 – CiCi collects sound samples of children’s voices for live mixing by Testcard. Micro cameras and radio microphones attached to the Feature Creature inflatables captured images and sounds directly into a live-mixed, interactive sound & video installation by Testcard. On the same day, a second film crew filmed children in workshops with authors as they rode in the pods at the London Eye [part of the Reading Revolution event]. This footage was then brought back to Tate Modern and mixed in with the live video & sound installation. More than 10,000 visitors saw the Feature Creature performance at Tate Modern, and over 450 school children interacted with it on the day. Feature Creature at Tate Modern was commissioned for World Book Day 2002 by the London Libraries Development Agency in partnership with the British Airways London Eye. Funded through an Arts & Business Award. Sound & Video Artists: Testcard featuring Lepke B.